Tonight's SmackDown will take place from the Legacy Arena in Birmingham, Alabama. Matches announced for tonight's SmackDown include Carmella vs. Sonya Deville and Rey Mysterio vs. Andrade "Cien" Almas. There will also be a segment with The Miz throwing a big birthday bash for Shane McMahon. Tonight's 205 Live episode will return to the 10pm timeslot with WWE Cruiserweight Champion Buddy Murphy issuing a non-title open challenge. * The Miz to throw Shane McMahon "The Best Birthday Bash in the World"
* What's next for Becky Lynch and Asuka? 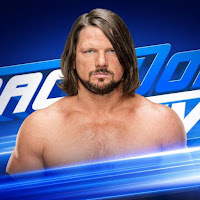 * Will AJ Styles find out how vicious Daniel Bryan can be?